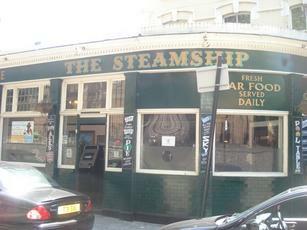 Just moved to the Blackwall area, and it turns out The Steamship is the closest pub to me. So, I gave it a try. As others have noted, it is a bit of a gem. Amidst all the new concrete and glass, it is refreshing to find something that approximates to a traditional street corner pub. I think the present landlady is trying to up-grade the place. The beer garden, albeit mostly for smokers I guess, is adorned with a nice array of flowers and, believe it or not, soft fruit (not sure if this is a reward for non-smoking customers?). The pub is spacious, and it seems there is pub food for sale, although I didn't try it this visit. Having just moved down from Yorkshire, I was pleasantly surprised to find Timothy Taylor's Landlord as one of the two cask ales on sale (£3.55 a pint). Friendly and welcoming staff. Well worth a visit. I was there at 17.00 on Wednesday, and it was pretty empty by the time I left, but was beginning to fill up. There is a pool table, a dart board and a couple of TVs. Certainly worth a return visit or two, methinks. I got the impression when walking in the door that this was a small one room pub, but it opens out on the right into a large bar/dining area leading to a smallish beer garden/smoking area at the back. It�s bare-boarded throughout, and although the walls in the front bar are adorned with some naval/maritime prints, the absence of anything on the walls in the back bar give it a somewhat Spartan appearance. It�s only a small thing, and not very important to me, but the walls would benefit from a few prints to break up the large flat surfaces. But maybe the intention is to create a cool, minimalist atmosphere? Anyway - there were a couple of large TVs showing a music channel. The real ales on were GKIPA and London Pride. I had the Pride (and at �2.80 a pint not unreasonable) which was not good, but drinkable. There was some food available (I was in there on a weekday lunchtime) consisting of some pretty basic pub grub at what appeared to be reasonable prices. As a guide, I had a tuna mayo baguette and a few chips for �3.50. The service was friendly enough, and perhaps I was a bit unlucky in not getting a good pint, so I would categorise this as an OK pub � nothing very special but OK. I would be happy enough to give it another go if I was in the area again. A good old fashioned pub. Just how all pubs should be. A quite spacious L shaped pub that you will never find by accident! With new buildings springing up in this area at alarming rates, the Steam ship is a throw back to old Victorian alleyways and backstreets and seems at odds with some of the surroundings. The interior, however, lacks any real character or warmth; everything seems very square and plain. The d�cor is quite old fashioned with dated wallpaper, bare floors and old paneling with a mix of hard and soft furnishings. A set of small canal themed watercolours of the sort that tend to populate car boot sales adorn the rear walls. The front bar is quite narrow but has a pool table at one end whilst to the rear the pub opens up with part used for dining. At the very back is a walled outdoor patio area. The bar can get a bit congested as this seems to be where the masses gather although this usually consists of a leaving do or post work drink up. The remainder of the pub has always been empty on my 3 or 4 visits. Decent quality beers (Green King IPA / Wadworth 6X / London Pride) but don�t expect all (or sometimes any) to be available. The 2 Plasma screens generally show Sky News or Sports, usually drowned by the jukebox. It is a decent enough place but it would be interesting to see how the place fared if there was some decent local competition. This pub was a gem of a find. First found it in 2000 whilst working here, at the time a great woman Teresa had it but unfortunately she sold up in Feb 2006 and moved to Ireland permanently but the other girl that has it Michelle, has done an excellent job. Top marks!